Tap 9 area to cycle dial colors. Tap Upper LCD display to cycle time modes, 24 hour, 12 hour, Stop Watch, UTC, TZ1, TZ2 and TZ3. in Stop Watch mode tap 2 to start/stop and 4 to reset. Tap Lower LCD display to cycle modes, date temp and condition, heart rate and steps count, Compass. Tap between 7 and 8 area to park hands. Tap Center area for dim mode menu. Tap mode text to cycle modes Normal, Always On and Off. Tap X to close. 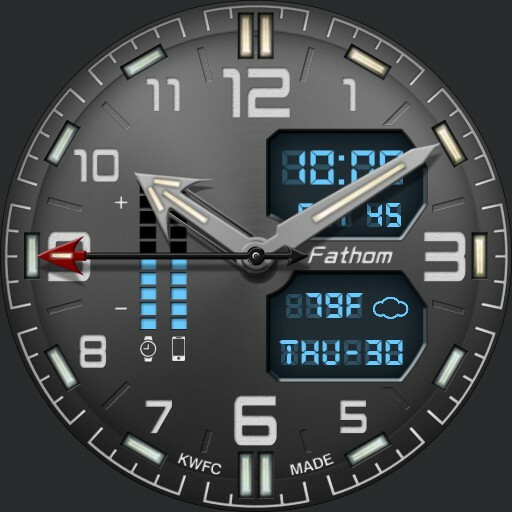 Seconds hand shows as additional watch battery level on dim. Utilizes UColor for digital text and a portion of the dim mode coloring.